A number of students (see pics below) from Robert Morehead Middle School participated in the annual Rotary Club kickoff of the local Dr. Martin Luther King Jr. celebration Tuesday. 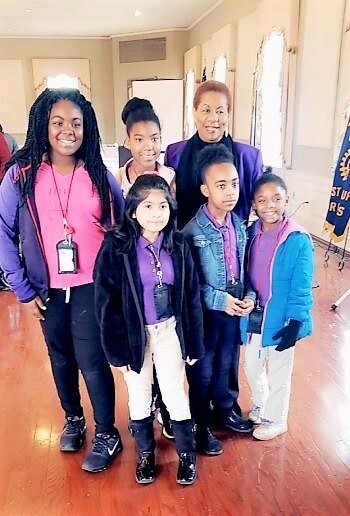 The Downtown Rotary Club was joined by the West Pine Bluff Rotary Club for the event, and by students from Morehead Middle School in the Dollarway School District who are involved in the Pen or Pencil Initiative. Mayor Shirley Washington was also in attendance. The Pen or Pencil program is for young people who commit to non-violence, community service and staying drug free. The program’s stated goals are to help youth to gain an appreciation for community service through teamwork and in the process empower them to make the right decisions in life. There is no charge for membership. RMMS Admin Asst., Mrs. Katina Browned served as a chaperone for the group.